Originally published under the title "London Cops Arrest Dozens for 'Hate Crimes' Since London Attack, But Mayor Says Police Can't Afford to Track Jihadists." 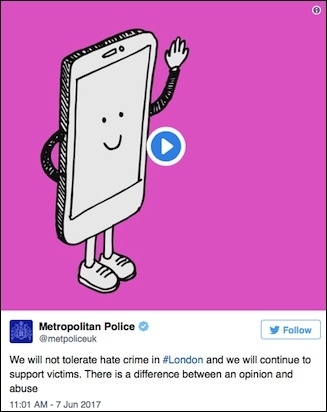 Screenshot of a public service video released on social media by London police after the recent terror attack. The Metropolitan Police have arrested 25 people since Saturday's terror attacks, using hate crime legislation to crack down on words and actions deemed either offensive, or which target people "because of their race, religion, sexual orientation" or disability. Since Saturday evening's attacks, we have increased the number of officers on the streets and in communities to reassure local people that they are able to go about their daily lives in peace and without fear of harassment or intimidation. Dedicated ward officers have also made contact with their local places of worship to encourage them to report hate crimes and to reassure those who congregate there that the police will take these crimes seriously. The Metropolitan Police has made 25 arrests for hate crime offences since Saturday. I can't follow 400 people... the Met Police budget, roughly 15-20 per cent comes from me, the Mayor. The rest is funded by central government. If the Met Police budget is being shrunk and reduced, they've got to prioritise and use their resources in a sensible, savvy way. Asked what could be a bigger priority than tracking jihadists in the UK's capital city, Mr. Khan declined to answer. All hate crimes are reviewed by a Detective Inspector and the MPS has also increased specialist investigators within the 32 London borough community safety units by 30 per cent, with more than 900 specialist members of staff dedicated to investigating all hate crime and domestic abuse crimes. With the average salary of a police officer in London standing at around £38,000, this means the force is dedicating around £35m of resources to hate crime policing. In February 2017, on the back of reductions in central government resource allocation, the mayor's plans involved a loss of officers for the Met, which he then rowed back on, blaming central government, eventually finding £27m extra from London's City Hall to allocate. The force also noted in its statement that it regards Tell MAMA — a group that lost government funding after it was found to be artificially inflating hate crime numbers — as a reliable go-to for hate crime reporting. In 2014, Tell MAMA lost its case with the Press Complaints Commission, when it objected to the original Telegraph reporting that revealed its dodgy figures. The Telegraph reported that many of their hate crime claims were exaggerations at best, and that out of the 212 "Islamophobic incidents" reported by Tell MAMA, 57 per cent happened only online, with a further 16 per cent of incidents not being verified. Only eight per cent of incidents involved physical targeting, and no attacks were serious enough to require medical treatment. The group maintains a blog frequently criticising President Donald Trump, anti-Shariah campaigners such as the Center for Security Policy's Frank Gaffney, and Breitbart.com. The Met Police statement adds: "We have increased the number of hate crime liaison officers who are a single point of contact for all those who need support after reporting a hate crime and we have introduced an Online Hate Crime Hub to tackle hate crime on social media."